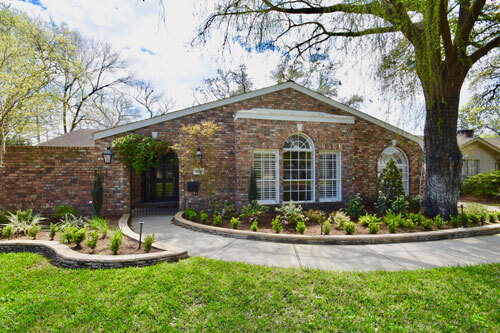 Leslie Lerner Properties announces their new Briargrove real estate listing at 6119 Ella Lee Lane. This is an amazing one-story home with a pool on a large, 13,575 sf (HCAD) pie-shaped lot. The ultimate entertaining home with open living areas, a wrap around yard, summer kitchen, multiple patios and grassy areas. The interior has been renovated to include hardwood floors, neutral colors, vaulted ceilings, a fabulous kitchen, breakfast room, wet bar, play/game room and a terrific master suite. The island kitchen boasts beautiful granite counters, a beverage cooler, gas range, stainless vent hood, SubZero refrigerator and tons of storage. The living and dining areas share a dual-sided gas fireplace with a terrific white brick surround. A spacious study and a game/play room are off the living area and have access to one of the back patios. The nicely-sized master suite has hardwood floors, vaulted ceilings and a bath with two sinks, beautiful marble, porcelain tile, claw-foot tub and shower. The backyard is unbelievable with a large pool, spa and plenty of room to relax and play.